Jim’s passion for woodworking began in his grandfather’s “old world” Michigan furniture shop. Jim started developing his woodworking skills at the age of 10. Turning his first bowl at the age of 15, he began to recognize his passion for wood turning. Jim first came to the islands in 1969, permanently moving to Maui in 1971, here he has enhanced his wood working skills over the past 35 years. For sixteen years he was a partner in Creative Cabinets in Haiku. Now living in Up-Country Maui, Jim has become a master wood turner, bringing his skills to new levels with his own original designs and translucent forms. He works with such exotic Hawaiian woods as Koa, Norfolk Pine, Milo, and Mango to name a few. 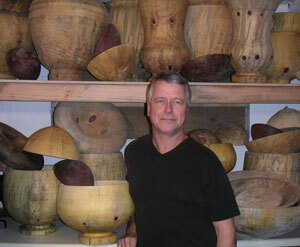 Jim’s Norfolk Pine wood turnings illustrate the meticulous care involved in his creations. First, pieces to be turned are selected by Jim and cut with his chain saw from the tree and into the beginning shape that he will put onto his 1,000 pound lathe. Some of these chunks of wood weigh well into the 200 to 400 pound range. After roughing the turned form to about one inch in thickness, it is then put into a plastic bag for up to six months to allow the wood to spalt. Spalting turns the color of the pine from white/yellow to golden brown with black patterns moving thru the wood. Spalting, along with the pine’s “circle of knots”, makes it highly desirable to the collector. Jim utilizes all these aspects in each piece to bring out their best in the finished product. Turning the forms to 3/16 of an inch, they are then subject to repeated submerging in an oil/resin mix for up to a month. This process yields the highest quality of translucence. Jim then applies multiple finish coats and then hand rubs to a lustrous sheen. The whole process takes anywhere from eight months to a year for the finished form. Jim prides himself with making many “one of a kind” pieces and is always thinking of new ideas. It’s not uncommon for Jim to get up in the middle of the night and draw a new idea on paper that has just inspired him. Turning fine pieces of wood is no longer just a passion for him, it’s an obsession.